It has been officially named as Wales' longest high street - but that does not mean it is Wales' busiest. According to Ordnance Survey, Bangor's High Street in Gwynedd has shops covering 1,265m - on a street which stretches 1.75km (one mile). But figures show nearly one in five shops are vacant in the city centre. Businesses and community groups are now being invited to bid for a slice of £2m in funding - in the hope they can breathe new life into the area. The money is part of Gwynedd council's successful bid for funding from the Welsh Government's targeted regeneration investment programme. The scheme in Bangor will support building owners and occupiers to enhance shop fronts - especially those that are currently empty. The council said it also wanted to see how it could help bring vacant commercial spaces back into beneficial use for the community. 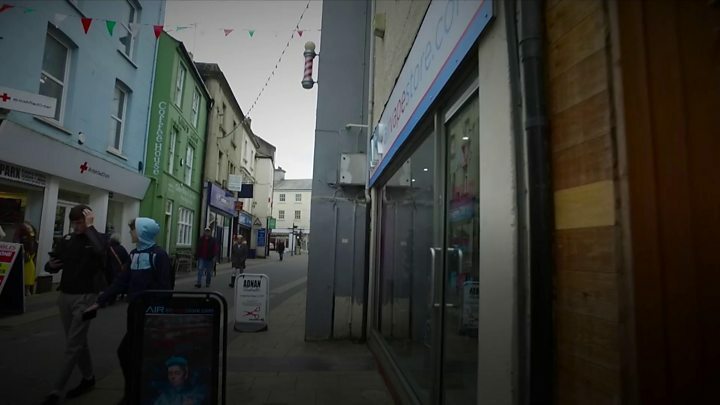 "The funding will target vacant, under-used properties and buildings requiring renovation within the commercial areas of Bangor city centre with the aim of stimulating investment, employment opportunities as well as contributing to the vitality of the area," said Ioan Thomas, who is the council's cabinet member for economic development. The council is hosting a drop-in event throughout Tuesday for shops and other groups in the city to find out how they could access the money. Image caption Market day is brisk for grocer Emyr Owen - but what about the rest of the week in Bangor? Emyr Owen, who runs the city's main fruit and veg stall at the Bangor weekly market, said he welcomed the cash injection - as long as it was "spent wisely". "Unfortunately, it's like every other town and city - even the likes of Llandudno - I mean there's just charity shops everywhere, and empty shops everywhere." Market butcher Neil Waite said more could be done to attract shoppers back into the city centre, adding: "Free parking - loads more activities on the streets - that would bring a lot more people in." The drop-in event is being held at the former Burton's clothing shop on High Street all day on Tuesday.